Four times stronger than stainless steel, a unique alloy blends chromium, cobalt, iron, manganese and silicon. It’s not Black Panther’s vibranium or Captain America’s proto-adamantium shield, but a new alloy has come pretty close. 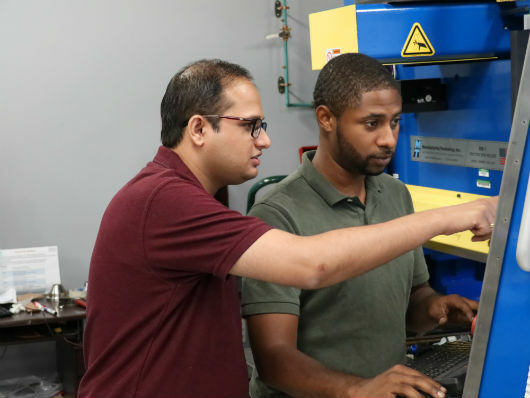 Our alumnus, a University of North Texas researcher Saurabh Nene has been working with UNT’s College of Engineering Department of Materials Science and Engineering to mix and flow material simultaneously, giving the alloy new strength. The alloy, which has no catchy name like its fictional counterparts, is created by melting and casting the materials, then taking the thin, flat mold to start “friction stirring,” Nene said. Nene, who has been working on this piece of research for eight months, said the process intensely deforms the metal’s makeup by forcibly inserting a rotating tool into the cold metal. The only problem with using Nene’s alloys commercially is the cost. While he said he could not estimate that exactly, he is trying to change the chemistry of the alloy to replace the cobalt element. For reference, cobalt costs $78,500 per ton. Iron costs $65. Nene, alongside lab colleagues Michael Frank, Kaimiao Liu, Brandon McWilliams and Kyu Cho of the U.S. Army Research Laboratory in Maryland, published a report July 2 in the online journal Scientific Reports. A paper related to the topic was also published in the journal in November 2017.